With a little help from a jar…. 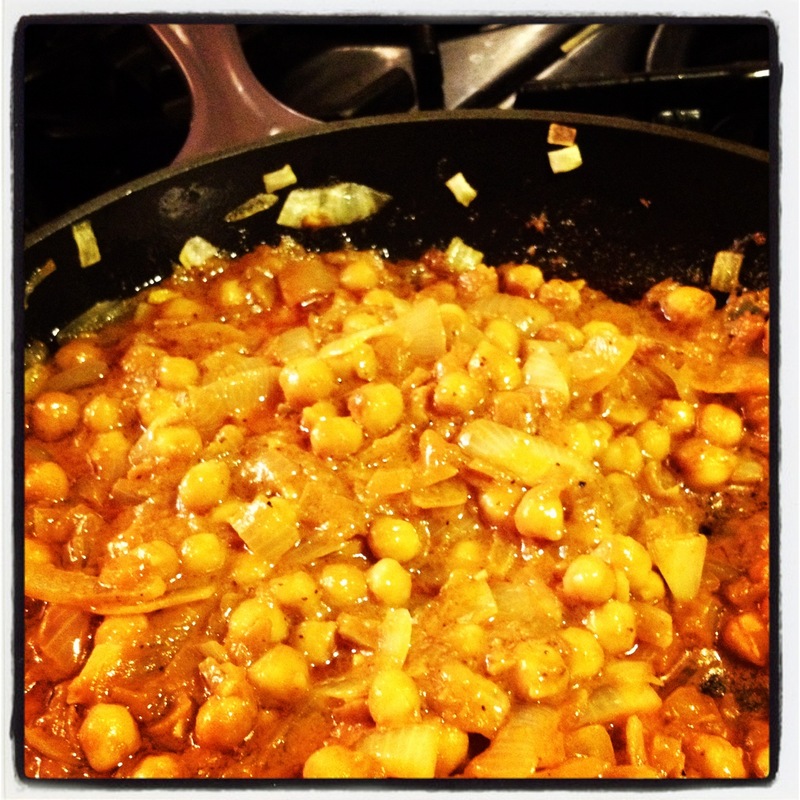 …can’t believe it’s not takeout 20 min Chickpea Madras Curry! Real talk: since I went back to school, nothing too inspiring or innovative has been coming out of my kitchen. Grilling, the same 2-3 dinners on rinse and repeat, and yes, more than one evening of Thai takeout. Every day I check cooking from afar and think “I need to make something delicious, stat!” and every Monday or Thursday night I find myself doing something boring….you know, not blogworthy. I suspected last Thursday would be no different. I was rushing home from 8 hours of class and I knew the cupboards were pretty bare. As I walked with my grad school partner in crime Emily, we received a flyer for a new Indian restaurant in Central Square. 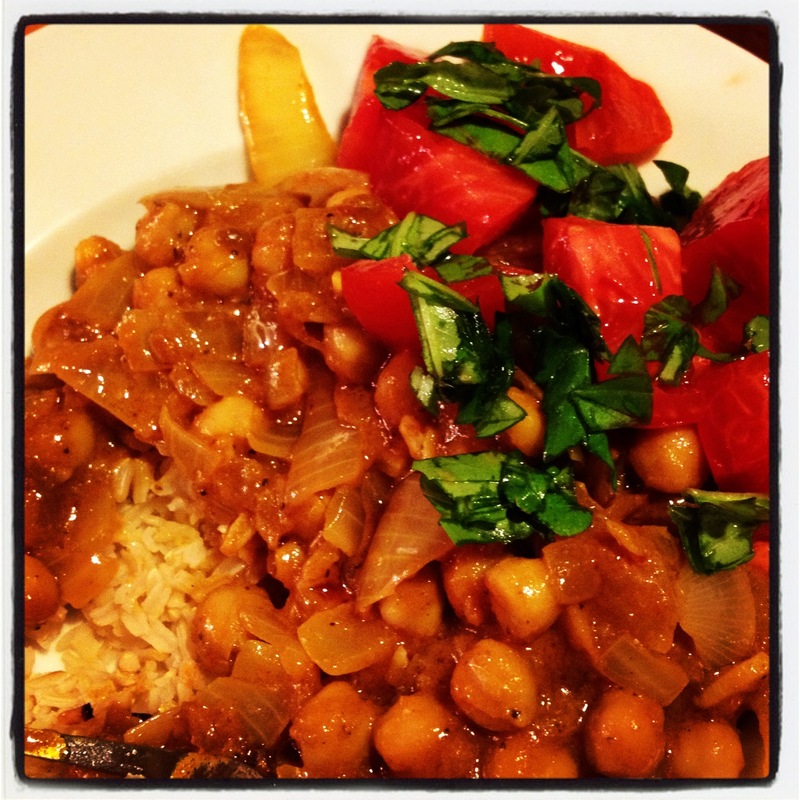 We both expressed a yearning for some Indian fare, especially with fall’s arrival and the new chill in the air. Inspiration struck. I remembered I had bought a jar of Indian Simmer Sauce on sale at Whole Foods a few months back. I selected it for its notable lack of heavy cream: its main ingredients are tomato paste, coconut milk, and various Indian spices. It’s the kind of thing you could definitely make on your own. But some Thursdays, you just don’t have time to. When I got home, I looked around for what else I had to simmer with this little number. Onions and garlic? Check. Jar of chickpeas? Check. Rice? Check. I set to work, and 1 hour later (which was mostly rice cooking time), I produced a curry so delicious that both of us felt it was just as good as takeout. Now, is this the most creative thing I’ve ever made? Does it showcase my formidable cooking skills? Not really (plus I burned the bottom of the rice). But I think it’s a quick meal that many of us can throw together and enjoy on a busy fall weeknight. I want to experiment with making the sauce on my own. Also, I think this would be tasty with some chutneys and a spiced yogurt sauce. But it’s also damn good just as it is: a weeknight dinner with a little help from a jar. 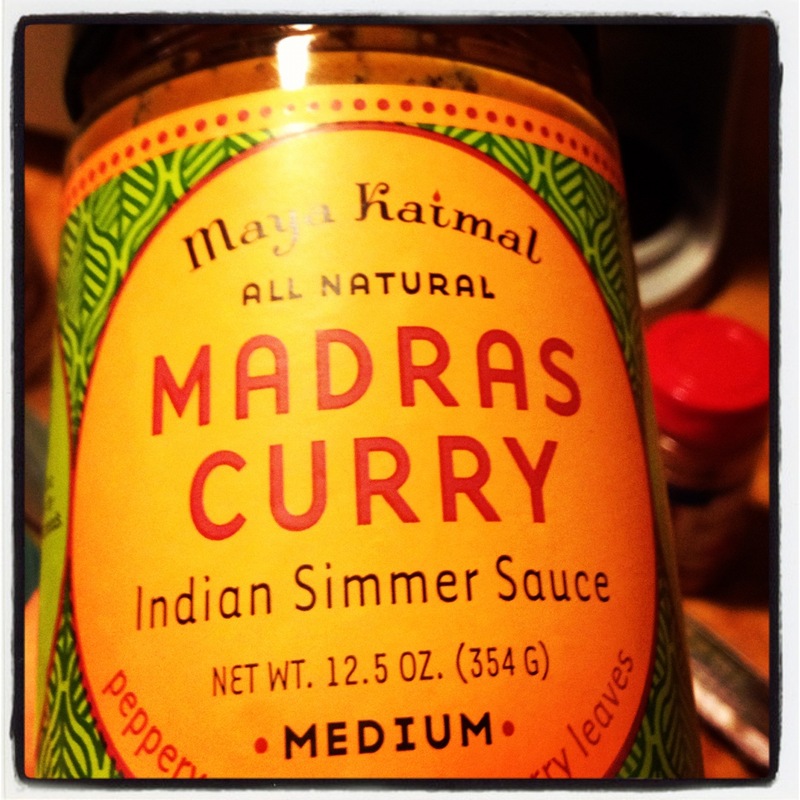 It beats the price of Indian takeout, and it definitely beats the cream content, too. Just wanted to share a snapshot of our weeknight dinners lately. Want to hear from the rest of you! What have you been cooking up so far this fall? toppings of choice (we had some of the last of the summer tomatoes, chopped, and some torn fresh basil). Meanwhile, sauté the onions and garlic in the coconut oil (used here to promote Indian flavors; if you don’t have any, olive oil or butter works fine). Over medium heat until onions garlic are translucent and soft (10ish minutes). Add chickpeas, sauté about 5-7 more minutes, then add simmer sauce until the mixture is warm. Add toppings if you wish and serve.